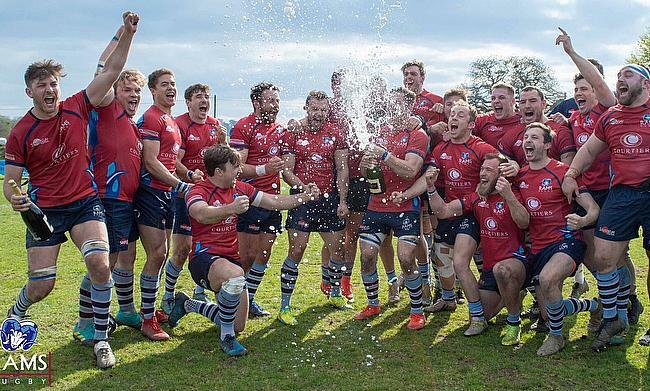 Rams RFC have clinched the National Two South title and automatic promotion to the third tier of English rugby following their victory over Clifton. After a slow start in Bristol, Seb Reynolds’ side showed their class to secure their 26th win of the term and a place in National One for next season after wonderful campaign. Directly below the Rams, the battle for the play-off place will continue into Round 29 as the main contenders all won. Second-placed Canterbury remain six points clear of rivals Tonbridge Juddians and Henley Hawks after their victory over Bury St Edmunds while TJs and the Hawks beat Redruth and Guernsey, respectively. Sticking with Guernsey, they have been relegated from National Two South following their defeat at Dry Leas and Birmingham and Solihull’s hopes of avoiding the drop suffered a setback after they lost to Barnes in Round 28. Dings Crusaders are still in the fight for survival following a dramatic defeat against Taunton Titans while Worthing Raiders are on the verge of safety after beating rivals Old Redcliffians. The other result in the division saw Old Albanian hammer already relegated London Irish Wild Geese. Rams RFC have been crowned champions of National Two South following a seven-try win over Clifton. Andrew Denham, Sean McDonnell-Roberts, Ben Henderson, Jamie Guttridge, Craig Nightingale and Jak Rossiter (2) all scored as Rams surged to the league title and promotion to National One. Clifton were unfortunate to miss out on a bonus-point, but Matt Salter’s side remain in sixth spot with two matches remaining. Tries by Hugh Campbell and Shek Sheriff had actually given the hosts the lead during the first half, but they could only add one more try through Jack Williams. Canterbury edged closer to securing the play-off spot in National Two South as they earned a bonus point win over Bury St Edmunds. Ben Leng struck an early penalty for Bury before Canterbury hit back with tries from Charlie Grimes and Matt Corker, either side of Levi Roper’s effort for the visitors. However, the away side were able to move in front as Mark Kohler and Jaid Wiltshire dotted down. But three tries in 13 minutes proved to be decisive for Canterbury as Sam Rogers, Dan Smart and Ricky Mackintosh all crossed to seal another crucial bonus-point win for Andy Pratt’s side. Leng did land another penalty for Bury, but the Wolfpack left Kent empty-handed as they couldn’t claim a try bonus-point. Tonbridge Juddians stretched their winning run to 11 matches after a battling performance against Redruth. After Jack Simmons’ early try for the home side, Truman Sullivan and Duncan Tout crossed for third-placed TJs. Tout and Will Colderick got TJs’ third and fourth tries after the break at the Recreation Ground. Simmons grabbed his second for Redruth and Richard Brown also went over for the hosts, but a solid last 13 minutes helped Peter Dankert’s men over the line as they remain six points behind the play-off spot. Henley Hawks kept up their hopes of a top two finish as they ran in 10 tries to defeat Guernsey, who had their relegation confirmed on Saturday. First-half tries from Xavier Andre, Alex Bradley, Leo Webb, Dan Barnes and George Griffiths opened up a 29-7 interval lead, with Owen Thomas crossing for Guernsey. Andre, Liam O’Neil (2) and Barnes (2) all went over after the break to secure another high-scoring win for the Hawks following their 52-0 thrashing of London Irish Wild Geese in Round 27. The Raiders did score three second half-tries, two for replacement Harry Barron and one for Matt Creber. Henley are still six points behind Canterbury with two games to go while Guernsey have suffered an immediate relegation back down to the fifth tier. Gary Kingdom’s last-minute penalty broke Dings Crusaders hearts as Taunton Titans snatched the victory in a thrilling contest in Somerset. The hosts led 19-5 at half-time thanks to tries from Nick Mason, Matt Jess and Barrie-John Chapman, while Jordan Grattan went over for Dings. The Crusaders brought themselves right back into the contest shortly after half-time as Harry Tovey and Ashley Challenger both scored, but Charles Samways replied for Taunton to make it 24-17. However, Dings refused to lie down and tries from Josh Trinham and Grattan put Luke Arscott’s side three points ahead. The drama then unfolded in the final seven minutes as Mason scored his second before a Tovey penalty looked to have won it for Dings, but there was one final twist as Kingdom once again rescued a late victory for Taunton from the tee. With Dings embroiled in a relegation battle, their bonus-points leaves them six points clear of the drop zone with two matches left to play. Old Albanian strolled to an emphatic victory over already relegated London Irish Wild Geese at Hazelwood. OAs outclassed their hosts in Round 28 as James Buckland’s side bounced back from successive defeats. A brace from Dan Watt plus tries via Tobias Munday, Charlie Hughes and Matt Deane gave the away side a 33-5 lead, with Richard Townsend dotting down for the Wild Geese. Watt completed his hat-trick and scored a fourth for OAs after the break while Luke Barber chipped in with a double to round-off a convincing victory. Birmingham and Solihull’s survival hopes in National Two South suffered a setback as they were thumped by Barnes at Portway. The visitors surged clear in the second period to secure this excellent bonus-point victory following tries from Alex Hind, Jack Garrett, Jamie Collins, Tom O’Toole and Will Davies. Barnes had led 10-5 at the break thanks to a Garratt try as well as penalty from Josh Hammett, while Matt Dight had crossed for the Bees. However, the home side were blown away after half-time and the Midlands club are now six points from safety with fixtures against champions Rams and play-off chasing Tonbridge Juddians to come. Worthing Raiders have all but guaranteed their safety in National Two South as they overcame rivals Old Redcliffians at Roundstone Lane. Old Reds got off to a flyer following tries from Chris Pursall and Ellis Joseph either side of two Matt McLean penalties for Worthing, but the Raiders responded as scores from Matt Walsh and Kiba Richards gave the hosts a 20-14 advantage. The away side did hit back through Kieran Ward just before half-time, but a try from McLean extended Worthing’s lead. Old Reds replied again as James Clements’ try cut the deficit to one point, however, Worthing were able to race clear in the remainder of the second period as Harry Forrest and Jack Forrest both touched down. The visitors were awarded a penalty try three minutes from the end, but Jody Levett’s side held on for a much needed and vital win. Worthing are now 10 points clear of the bottom three whilst Old Reds are seven points above the relegation places with two games left to play.